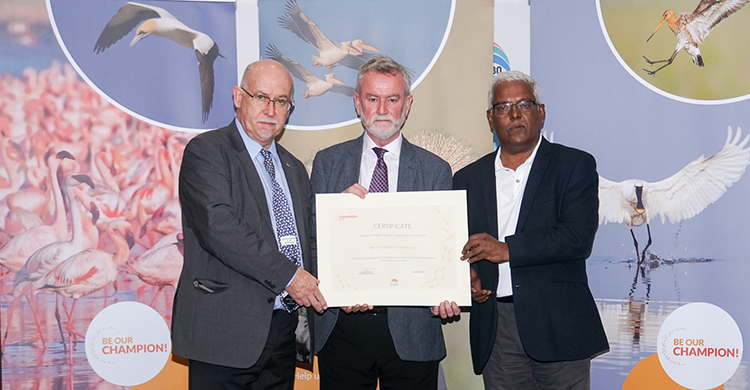 Durban, 7 December 2018 – Today Norway and the European Commission will be declared ‘Champions’ of waterbird conservation. The ceremony will take place during the Gala Dinner kindly offered by the Government of South Africa in the margins of the Seventh Meeting of the Parties to the African-Eurasian Waterbird Agreement (AEWA) currently underway in Durban. The awards recognize the contributions made by Norway and the EU in supporting two of the main AEWA conservation initiatives in Europe and Africa. The two new Champions will be honoured for their support of the European Goose Management Platform and the AEWA African Initiative. The Government of Norway will be recognized as Champion Plus for its generous support and commitment towards the European Goose Management Platform for the period 2016-2018. Established in May 2016, the European Goose Management Platform aims to ensure the sustainable use and management of goose populations in Europe, through maintaining them at a favourable conservation status, while taking into account concerns of relevant stakeholders. The European Commission will be rewarded with Champion Plus status for its generous support and commitment towards the AEWA African Initiative for the period 2017-2020. The AEWA African Initiative is a package of support which aims to promote the implementation of AEWA in Africa and thus help conserve migratory waterbird populations under threat. The generous EU grant for the period 2017-2020, through the Global Public Goods and Challenges (GPGC) Cooperation Agreements with the United Nations Environment Programme, focuses on the conservation of iconic species such as the White-winged Flufftail and the Grey-Crowned Crane as well as by promoting effective flyway conservation for francophone countries. Launched in 2014, the Migratory Species Champion Programme has recognized several institutions. It is open to governments, companies, organizations and individuals willing to make a financial commitment of at least three years for one or more specific initiatives that fall under AEWA and the CMS Family umbrella. It offers a portfolio of initiatives that contribute to the implementation of a large programme targeting a species, a group of species or a cross-cutting issue.